Even in cloudy, rainy Seattle, vinyl blinds can become yellowed from sun damage. 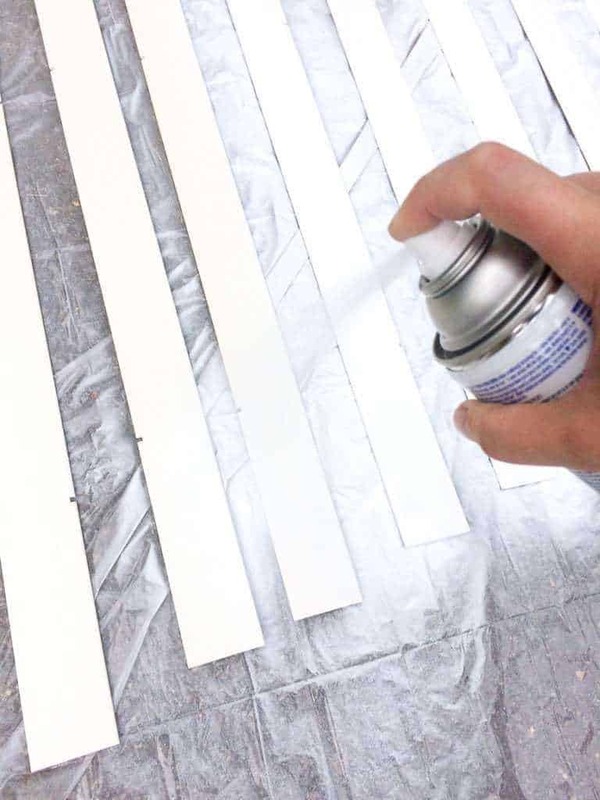 But with a few cans of spray paint, you can change the look of your window coverings without spending a fortune on new blinds! Our house came with cheap aluminum blinds that didn’t do much aesthetically or functionally. When a neighbor decided to change their window coverings to curtains, we inherited their much nicer blinds. Our 1940’s houses are mirror images of each other, so they fit perfectly in our windows! Instead of putting them up right away, I decided to do a little experiment with one set. I took out all the slats and gave them a good scrub. You might want to rough yours up with sandpaper if they are slick vinyl so that the paint sticks properly. Then I picked up some Rustoleum Ultra Cover 2X spray paint in flat white, which adheres to vinyl and plastics. I also got a cheap plastic drop cloth to protect the grass from overspray. 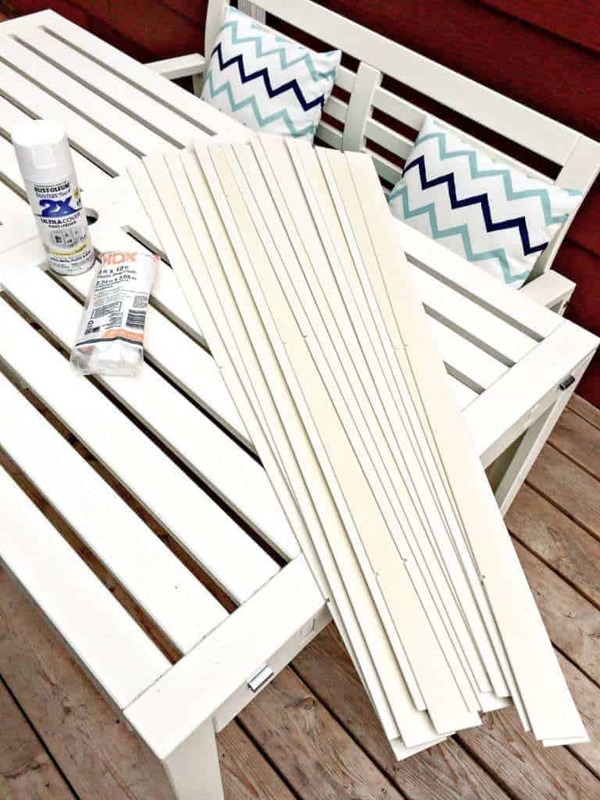 You can see how much the color has changed on the slats when you put them next to the white table. One side was more discolored than the other, so I tried to put all the darker sides facing up for the first coat of paint. Then I hit them with the spray paint, using long, light passes. There’s a lot of paint flying around, so you will want to do this in a well ventilated area and wear a mask. 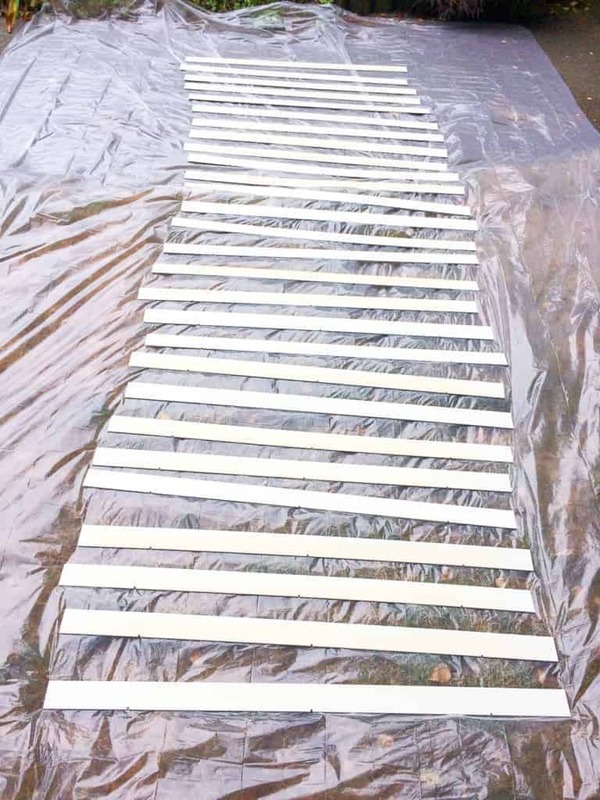 Laying them all out in a row like this made it easy to see which slats needed more paint. I applied three coats to the darker side and two to the lighter one, and I used three cans to get total coverage. Make sure that when you flip them over, you put them back in the same void they left on the drop cloth. I wasn’t careful about this, and I had some of the overspray peel off and stick to the finished side. My heart stopped when I thought I had ruined them, but I lightly rubbed them with a damp paper towel and it all flaked off. Whew! After both sides dried, I stacked them up and gave all the edges a very light coat of paint, just to make sure I got every surface. Be careful not to spray too much or you’ll get drips! I attached the headrail to the window frame using new mounting brackets, then extended the strings all the way down. After that, it was a simple (yet time-consuming) matter of threading each slat back through the strings. After attaching the cornice piece to cover up the headrail, my blinds were finally done! I can’t believe how much of a difference it makes in the room. 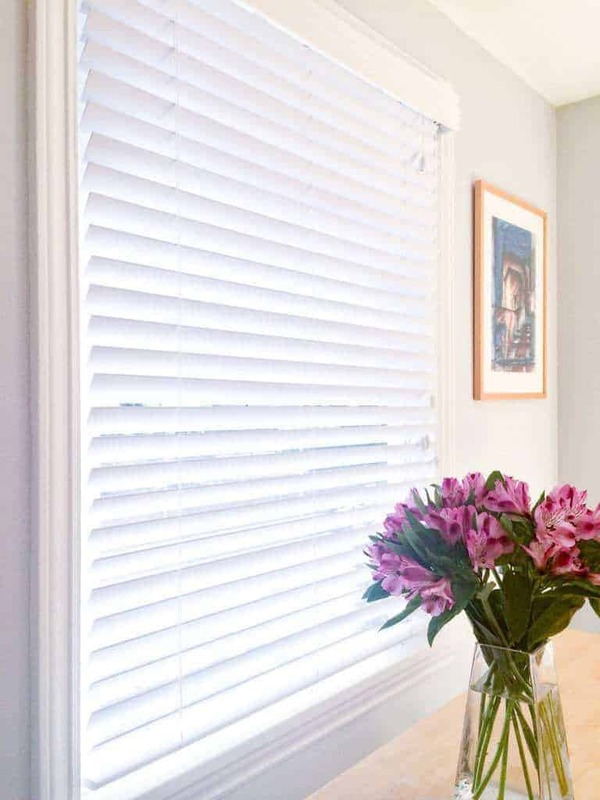 The flat white color blends well with the window trim and makes it look like a complete unit. 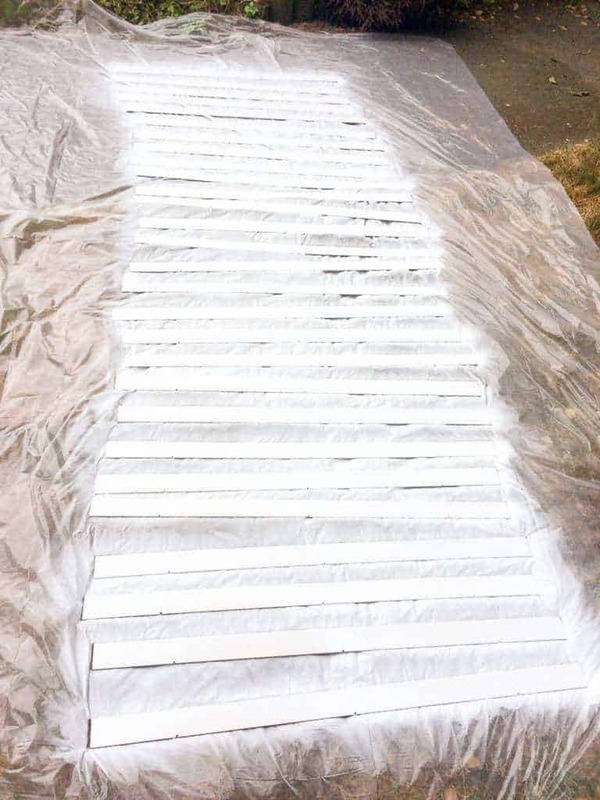 My husband thought I was crazy to attempt to spray paint blinds, but even he agrees that it looks amazing. We’ll leave them tilted up like this most of the time because it’s a non-opening window facing the alley. It allows just the right amount of light in without sacrificing privacy. I’m so glad my experiment was a success, and I can’t wait to tackle the rest of the blinds! 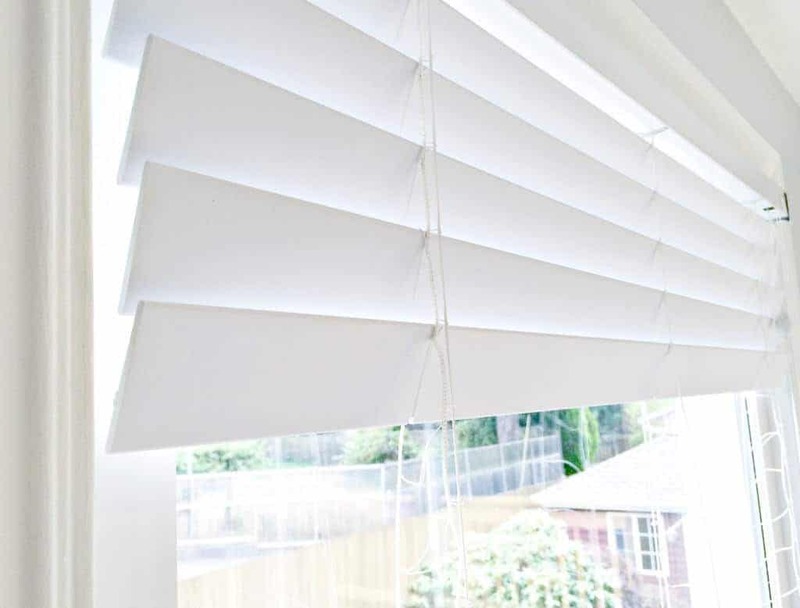 That’s a really smart way to revamp your blinds! I was just looking at mine and wondering if there was a way to make them look new again. I didn’t think of a coat of spray paint though! It worked out even better than I thought it would. You should give it a try! This is a great idea! Honestly, I didn’t know that blinds faded after a while. I think that spray painting them is a way better option than replacing them. I’m going to go home and check if we need to do this to ours. I don’t pay that much attention to our blinds. I didn’t realize that the sun could start to yellow vinyl. At least a can of spray paint is a good way to fix it. It’s much cheaper than replacing them every time you want them fixed. I really loved it the way it has been created here! It can really add value to the look of our surrounding. Really great job done! What all I can say AWESOME! Thank you!! Just finished removing my blinds (I lay them on a tarp and clean with a hose and a brush after spraying them with a good spray cleaner) and hanging outside to dry. Every year I notice they are becoming yellowed where the sun hits them. These are crazy expensive as they are custom blinds. I’ve tossed around the idea of spray painting them, now you’ve given me the courage. Thanks for a very practical tip almost everyone can use. Thank you so much for taking the time to comment. I love hearing how my tips help people! Our blinds were custom too, and I couldn’t bear to replace them just because they were becoming yellowed. Good luck spray painting yours!